Leitrim 0-6 Mayo 2-5 (Ballinamore, 4/2/1962). MAYO: J Foye; S Hunt, V Nally, R Clarke; C Hanley, J Farragher, P Griffin; J Langan, J Morley; T Treacy (1-1), F O’Leary (0-1), E Melvin; M Kennedy (0-2), M Ruane (1-0), S Rowe. Mayo 2-3 Meath 1-13 (MacHale Park, 4/3/1962). MAYO: J Foye; S Hunt, W Casey, S O’Reilly; C Hanley, J Farragher, R Clarke; J Morley, PJ Loftus; T Treacy (0-2), E Melvin, P Griffin; S Rowe (1-0), M Ruane (1-1), T O’Boyle. Subs: P Bruen for Loftus, P Farragher for Rowe, V McCombs for Melvin. FIRST ROUND: Mayo 1-13 Sligo 3-7 (Fr O’Hara Park, Charlestown, 10/6/1962). 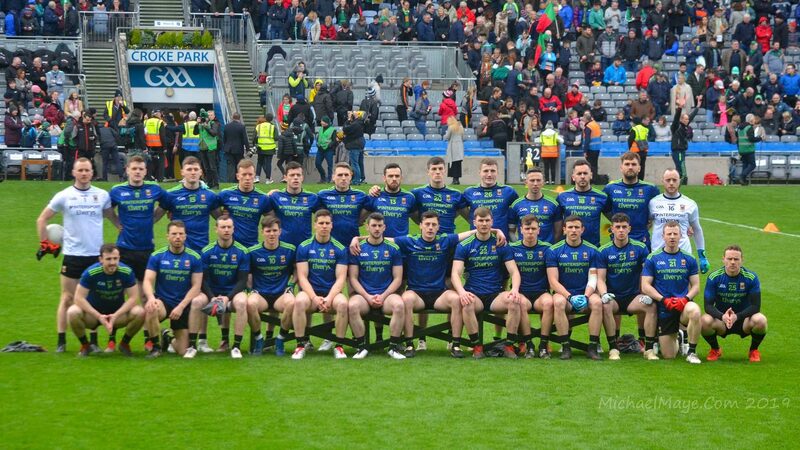 MAYO: J Foye; S Hunt, S Reilly, B Keane; E Walsh, M Walsh, P Gibbons; J Langan (0-2), J Morley; J Corcoran (1-4), J Farragher (0-1), M Ruane (0-1); W Casey (0-2), P Gibbons (0-3), M Clarke. Sub: PJ Loftus for Reilly. FIRST ROUND (REPLAY): Sligo 1-7 Mayo 1-6 (Markievicz Park, 24/6/1962). MAYO: J Foye; S Hunt, B Keane, C Hanley; E Walsh, M Walsh, P Gibbons; J Langan, J Morley; J Corcoran (0-2), J Farragher (0-1), M Ruane; W Casey (0-1), F Gibbons (0-2), E Maguire (1-0). Mayo 2-7 Sligo 0-10 (James Stephens Park, Ballina, 14/10/1962). MAYO: J Foye; C Hanley, V Nally, J Healy; E Walsh, J Jennings, P Gibbons; J Langan, J Morley; P Griffin (0-1), L O’Dea (2-0), M Fitzpatrick (0-3); S Rowe (0-1), F Gibbons (0-1), T O’Boyle (0-1). Longford 0-4 Mayo 2-11 (Pearse Park, Longford, 21/10/1962). MAYO: J Foye; B Rutledge, V Nally, C Hanley; E Walsh, J Jennings, P Gibbons; J Langan (1-1), J Morley (0-1); P Griffin (0-2), F Gibbons (0-1), M Fitzpatrick (0-2); S Rowe (0-1), L O’Dea (0-1), T O’Boyle (1-2). Mayo 2-3 Cavan 1-3 (Westport, 4/11/1962). MAYO: J Foye; M Cosgrave, V Nally, C Hanley; E Walsh, J Jennings, P Gibbons; J Morley (0-1), J Langan; P Griffin, F Gibbons, M Fitzpatrick; P McGee, L O’Dea (2-1), S Rowe (0-1). Westmeath 0-8 Mayo 1-7 (Cusack Park, Mullingar, 18/11/1962). MAYO: J Foye; M Cosgrave, V Nally, J Healy; E Walsh, J Jennings, P Gibbons; J Morley, J Langan (0-1, a free); P Griffin, F Gibbons (0-1), M Fitzpatrick (0-3, frees); S Rowe (1-2), L O’Dea, T O’Boyle. Sub: M Loftus for Morley. PRELIMINARY ROUND: Sligo 0-9 Mayo 3-13 (Markievicz Park, 24/6/1962). MAYO: T Staunton; A Brett, J Earley, D O’Leary; J Cleary, E Carroll, P Corrigan; M Connaughton (0-3), M O’Malley (0-2); T Grimes (0-1), P Costello (0-2), D McSweeney (3-1); C Dolan, N Maguire (0-2), JJ Cribben (0-2). SEMI-FINAL: Mayo 7-10 Roscommon 0-7 (Fr O’Hara Park, Charlestown, 8/7/1962). MAYO: L McEllin; A Brett, D O’Leary, J Cleary; P Corrigan, S O’Connor, E Carroll; M Connaughton (1-0), M O’Malley (1-4); C Dolan, P Costello (1-2), F McDonald (2-1); L MacHale (0-1), N Maguire (1-0), JJ Cribben (0-1). Sub: T Grimes for Connaughton, N Golden (1-1) for MacHale. FINAL: Mayo 7-8 Galway 0-10 (MacHale Park, 22/7/1962). MAYO: L McEllin; A Brett, J Earley, D O’Leary; J Cleary, J Carey, E Carroll; M Connaughton (2-0), M O’Malley; F McDonald (1-5), P Costello (1-2), D McSweeney (0-1); N Maguire (3-0), JJ Cribben, C Dolan. SEMI-FINAL: Mayo 2-12 Down 1-9 (Croke Park, 19/8/1962). MAYO: L McEllin; A Brett, J Earley, D O’Leary; J Cleary, M Brennan, E Carroll; M Connaughton, M O’Malley; F McDonald (1-6), P Costello, C Dolan (0-1); JJ Cribben (1-2), D McSweeney (0-1), N Golden (0-1). Subs: N Maguire (0-1) for Golden, J Carey for O’Leary. FINAL: Kerry 6-5 Mayo 0-7 (Croke Park, 23/9/1962). MAYO: L McEllin; A Brett, J Earley, D O’Leary; N Golden, M Brennan, E Carroll; M Connaughton (0-1), M O’Malley; F McDonald (0-4), P Costello (0-1), C Dolan; N Maguire, D McSweeney, JJ Cribben (0-1). Sub: T Staunton for McEllin.